Geometry Dash app for iPhone is a fun game wherein you got to jump and flip your way through obstacles and dangerous passes. What you need to survive is timing and of course, quick fingers. It has lots of levels to keep you entertained for hours on end. 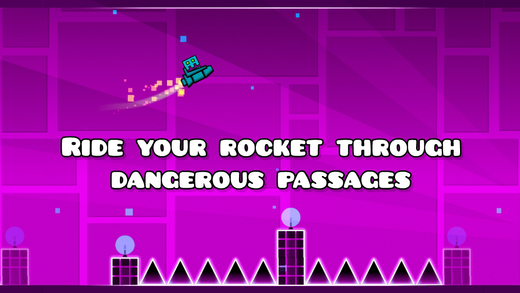 You can get Geometry Dash game for $1.99 from iTunes App Store. The game play of Geometry Dash app for iPhone is simple: tap to jump or tap and hold to jump repeatedly. Some environmental objects such as glowing disks make it possible to make midair leaps. But the core aspect is timing. It is not as easy as it might sound. Touching anything other than solid ground or one of those special interactive elements mean instant death. If you fail, you’re again back to the beginning of the level. If you manage to win, you’ll earn lots of bragging rights. Every time you win a stage in the first attempt, it unlocks a new character icon that players can use to customize their runner. In fact, you can find other tap-and-jump type of games in iTunes. What make Geometry Dash for iPhone different from the rest are the extras. The game features a useful practice mode that intermittingly drops checkpoints that makes clearing a level much easier for the players. Of course, the real fun is playing the ‘real’ game. But being able to make few tries without having to go back to the beginning of a level is a great way to get used to the game layout. Players can also create/share their levels with a simple editor. The graphics is good, if not great. The game is stable and responsive for most parts. We’d never experienced any freezing or lag while testing the game. Geometry Dash app for iPhone is certainly a challenging game. But it still gives players a fighting chance to win the levels. But to go back to the beginning of a level after reaching within an inch of the end of a level due to a small slip-up can be frustrating at times. The practice mode comes handy in that context, by preparing oneself for the challenges of a level in advance. The game is stable and responsive. Go ahead and check it out if you’re a fan of challenging yet interesting games.